Chocolate tablets: you’ll never see anything like this! Tasty and easy chocolate bars, try to make them. To make these wonderful bars you'll just need to pour the melted chocolate into the milk container. 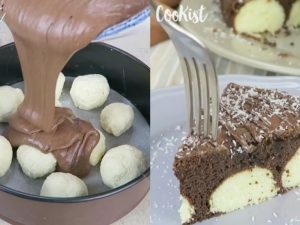 Ingredients: 300g dark chocolate, melted; 500g white chocolate, melted; 2 chocolate bars; 1/4 cup hazelnut, chopped; 1 cup chocolate candies with nuts; 1/2 cup strawberry, halved; 1/4 cup jelly candies; 1/2 cup chocolate cookies. Cut the 2 containers of juice or milk into 3 parts. 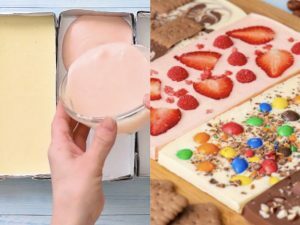 Divide white chocolate into 3 parts, color 1 part with pink color. Pour pink chocolate into 1 of the containers, decorate with strawberries and jelly candies. Pour white chocolate into second container, decorate with chocolate candies, and crush some candies on top. Pour 2/3 of the dark chocolate in the third container and decorate with chocolate bars and crushed hazelnuts. Pour white chocolate into fourth container and add some dark chocolate on top, using wooden stick make some swirls and decorate with chocolate cookies and some cookie's crumbs.